Hundreds of angry residents gathered at Poinguinim Bazaar and blocked the national highway for all vehicular traffic in protest against what they termed as the lackadaisical attitude of the authorities towards the increasing number of accidents on NH-66 road. Failure of the authorities to come on the site of the Saturday midnight accident angered the residents, forcing them to block the highway at 12.30 pm on Sunday. The agitated residents were led by Loliem-Polem sarpanch Ajay Lolienkar and joined by Poinguinim deputy sarpanch Elda Fernandes and some of the village panchas. According to the residents, they were assured by the Deputy Collector Sagun Velip he would visit them before 11 o’clock to address their fears. Burt neither Velip nor the police came to the spot, they lamented. People waited till 12 o’clock and finally at 12.30 decided to block the highway. The vehicular traffic was not allowed to cross the narrow stretch at Poinguinim Bazaar, which often has been at the receiving end of several mishaps including deaths in the past. The plying of traffic on either side was stopped resulting in serpentine queues. 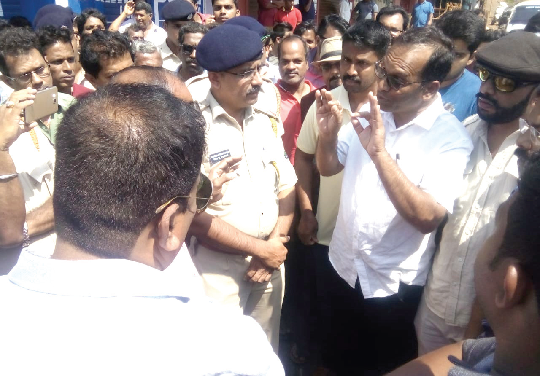 Following blockade, Canacona PI Rajendra Prabhudessai reached the spot and pleaded with the agitators to allow the traffic to ply. However, people strongly objected and sought a strong assurance from the Deputy Collector. The people demanded immediate stop to plying of heavy traffic via Polem border and erection of speed breakers to regulate rash and negligent driving. Deputy Collector Velip reached the spot at about 2 pm. He assured the residents of a meeting with PWD (Highway) and RTO and other authorities concerned on Monday at 4 pm at Poinguinim to discuss on stopping of heavy vehicular traffic.